Welcome to the University of Chicago. We invite you to explore our campus and community where we’re hard at work enriching human life through rigorous scholarship. Plan your visit to the University of Chicago campus and Hyde Park neighborhood by reading about our architectural sites, local shops and restaurants, and special events. Make sure to download our campus guides for more information. Learn more about visiting the University of Chicago as a prospective undergraduate student. 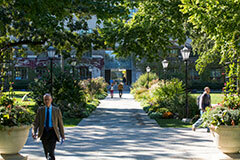 Discover campus offerings for prospective graduate students at the University of Chicago. Learn more about tours, landmarks, and must-see spots in Chicago’s downtown and 77 neighborhoods. Have a general question about visiting the University? Contact us.